Hear, Here began as a set of classes taught as part of the Public and Policy History Major and the Photography Minor at UWL in 2014-2015. On 12 April, 2015 the project was presented to the community as part of a downtown event. The project has evolved into a community venture. Those who listen using their mobile phones can stay on the line and record their own stories. If the stories fit the objectives, they are re-recorded and added to the program. Hear, Here shares the diverse stories and voices of downtown La Crosse. We seek out the stories of business people, tourists, and those that call downtown home. We also hear voices of people who experienced downtown long ago by including stories from the Oral History Program at the UW-La Crosse Murphy Library Special Collections. We began with 28 stories in April 2015, with the tell-tale Hear, Here signs hanging in the downtown area to mark story locations. This was the beginning of our continuous journey to spread hidden history. Our goal was to have 60 stories by 2020, expanding both the diversity of our stories as well as our community impact. We surpassed our goal! As we grow, so does access to the rich history which surrounds us every day. We have over 69 stories currently operating in downtown La Crosse. We strive to collect more each day. Citizens of La Crosse hear about the big history of the city. We know about our founder, Nathan Myrick, and lumber barons like the Hixons. We hear about the 89.8% white population. We do not hear about the 10.2% made up of Black, Hmong, Ho Chunk and other ethnic groups. Groups like the LGBTQ+, foreign nationals, and those who have experienced homelessness have often been overlooked in our history. How can these stories be documented and told in our community? How do the stories from historically underrepresented peoples reflect on the community at large? How might the community change and evolve knowing that La Crosse, like all cities in our complicated and nuanced world, has its prejudices, struggles, and injustices? Hear, Here sees itself as a vehicle for all stories in the community-both those that praise and challenge traditional views. It is an opportunity for people to have public conversations about how we might create a more ideal and just city. We at Hear, Here hope that citizens of La Crosse will see the stories as an opportunity for education, growth, and change. Ariel Beaujot is a history professor at the University of Wisconsin – La Crosse. History was her inspiration. Hear, Here was her vision. With the support of undergraduate students and community members, Ariel was able to transform a dream of shared voices into a reality. Jenny DeRocher has been active with Hear, Here since its inception. She originally worked recording new stories and editing previously recorded oral histories. Now that she works at the La Crosse Public Library Archives, Jenny promotes local history and Hear, Here by creating and leading walking tours. 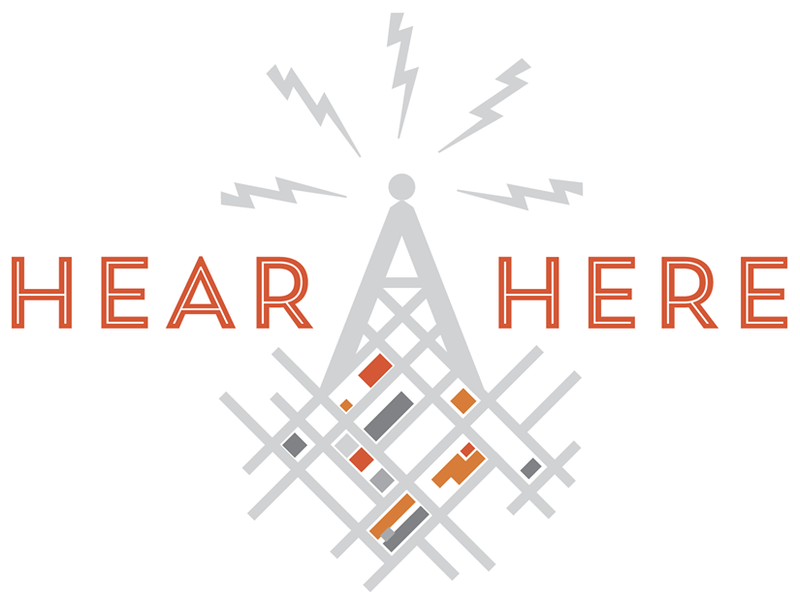 Calli Niemi is the woman behind the phone lines of Hear, Here. She works with an Interactive Voice Response system to bring you stories past and present. Calli also designed and developed the 4th grade curriculum. Sara Krueger and Hannah Siech are our masterful webmasters, putting up new stories, media, and links as they come in. Sara designed and developed the High School and 8th Grade curriculum. Laura Godden has been instrumental in putting the project together and mentoring students in local research. Under her guidance, students discover and interpret primary sources, enhancing their analytical skills.